This Friday March 31 at 10am CST GIVE ME GLOW is releasing their first eyeshadow palette! Their owner, Brandy, was sweet enough to send me an advanced sample to share you guys! Okay let’s start with packaging and work our way through. The pans were sent packaged separately and there’s labels on the backs. And then there’s labeled, magnetic slots for each shade. And the back. We’ll discuss the ingredients a little later in the review. And the gorgeous shadows!!! 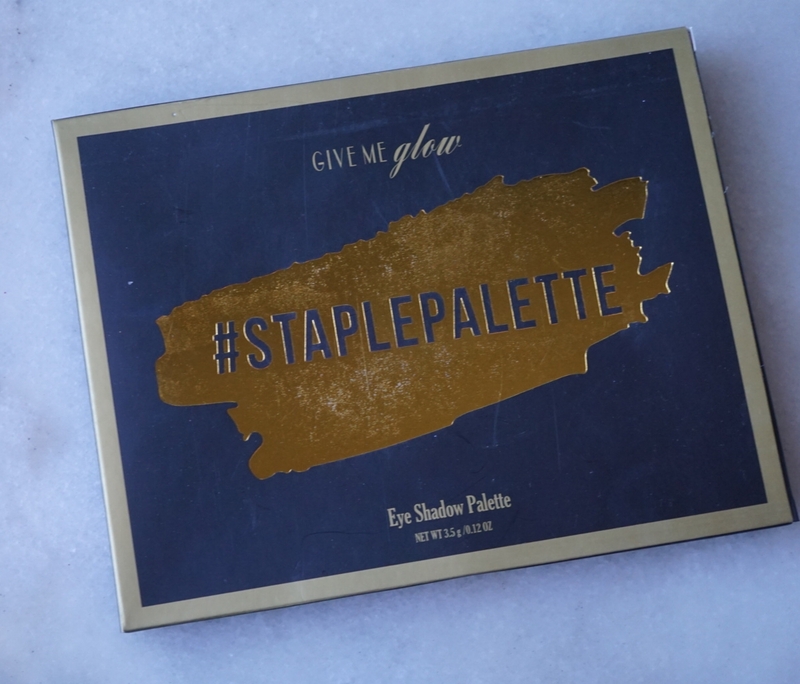 The palette is a light weight cardboard with a large mirror. This is a permanent item and it’s going to cost $54. 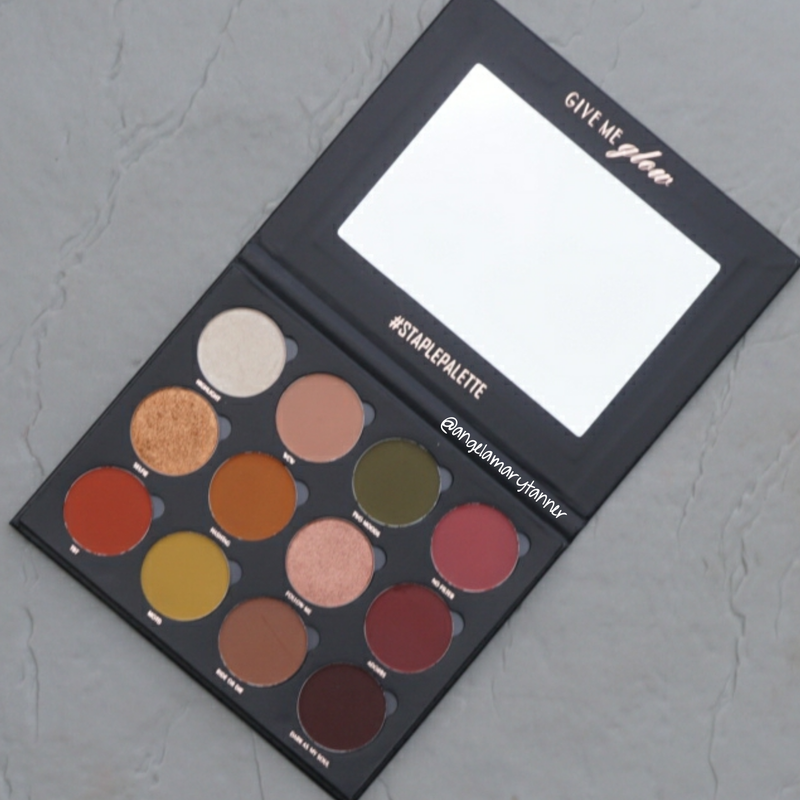 You’re getting 12 large pans: 9 mattes, 2 metallics and 1 satin. Each pan is 3.5g (.12oz) for a staggering total weight of 42g (1.44oz)! Which works out to around $1.29 per gram. For perspective, the ABH Modern Renaissance palette is $42 for 9.8g which is around $4.29 per gram. Now some (myself included) will argue that large pans aren’t necessarily beneficial because who knows how much you’re going to use them. And of course this is subjective but for me these are very useful neutrals that I’ll use on a daily basis, so I appreciate the large pan size. Alright so let’s get into some swatches!!! HIGHLIGHT is pearly ivory with a satin finish. WCW is soft brown matte. 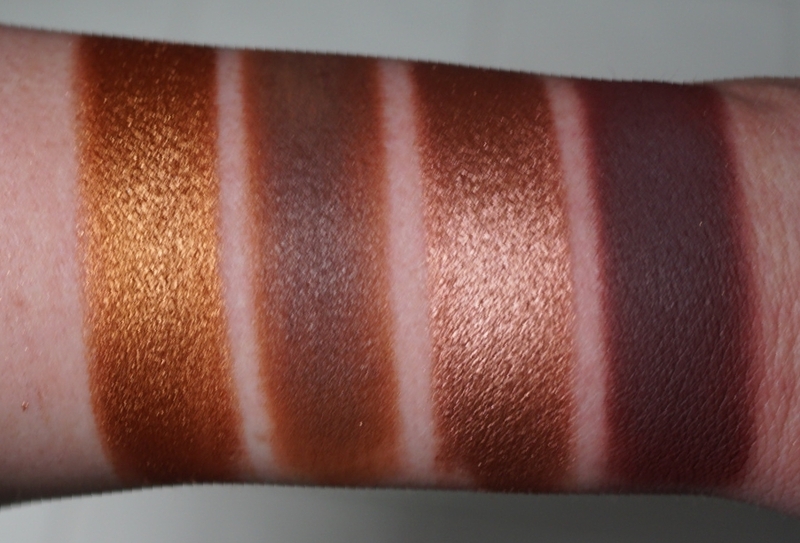 It’s similar to MUG CREME BRULE and MAC SOFT BROWN. TWO MOODS is deep forest green matte with olive undertones. NO FILTER is a light, soft burgundy matte. SELFIE is an ultra metallic amber gold. 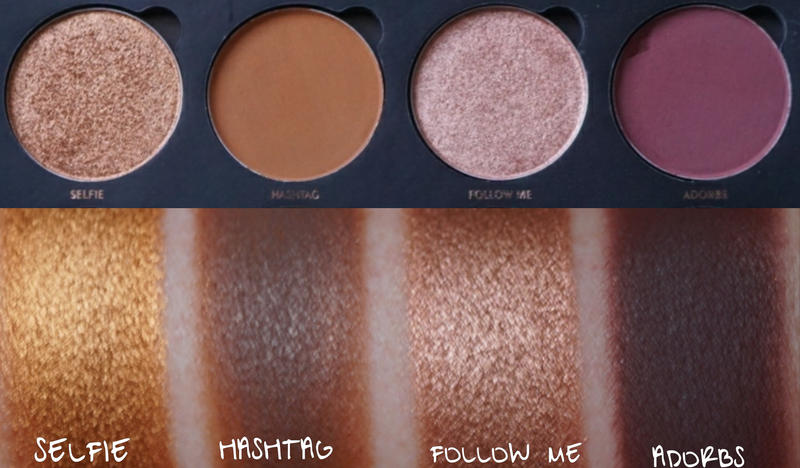 HASHTAG is medium warm brown with subtle orange undertones. 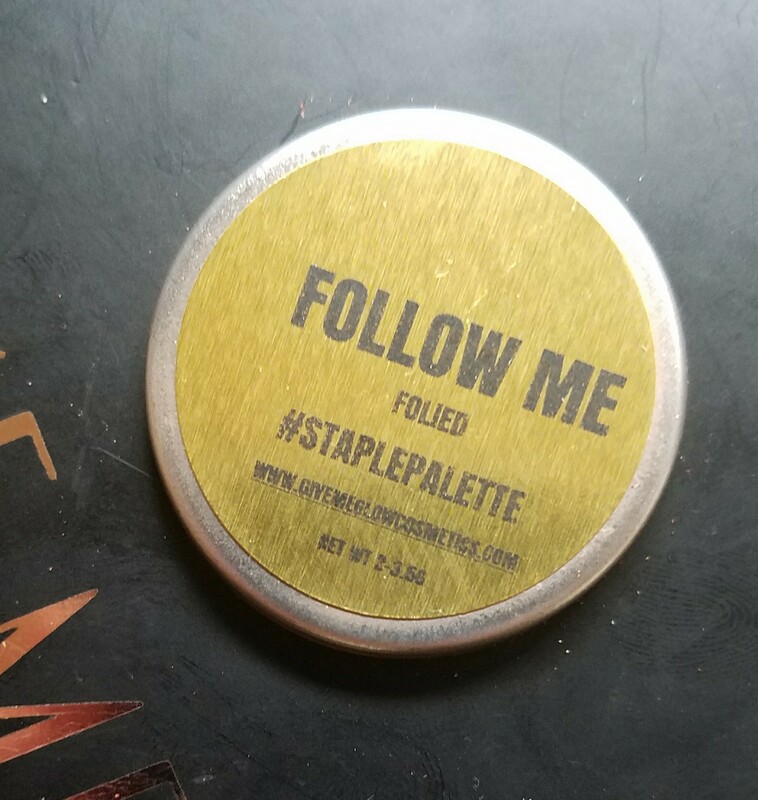 FOLLOW ME is an ultra metallic warm bronze with copper undertones. ADORBS is a deep red brown with strong burgundy undertones. It’s similar to MUG CHERRY COLA. MOTD is a medium khaki brown with strong mustard yellow and more subtle olive undertones. RIDE OR DIE is a dark medium taupe brown. DARK AS MY SOUL is a very dark matte brown. Okay so let’s start with the positives. As you guys know, I don’t have any first hand knowledge regarding the manufacturing of cosmetics but over the past year I’ve become good friends with lots of women who do. So I feel confident in saying that matte eyeshadows are one of the most difficult products to formulate. 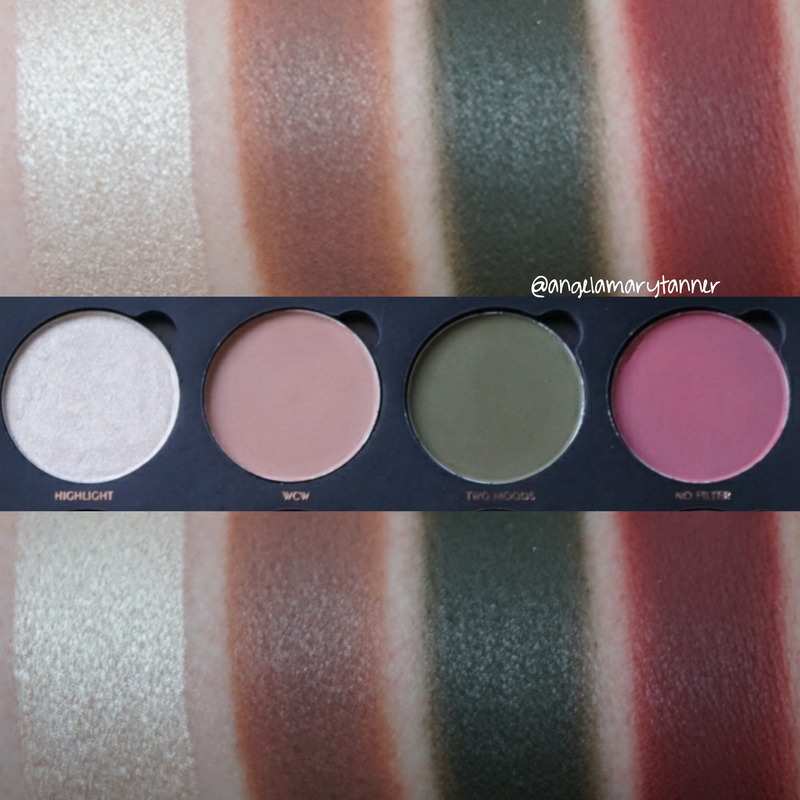 So the fact that GIVE ME GLOW’S first eyeshadow palette is 75% matte says something about her determination. 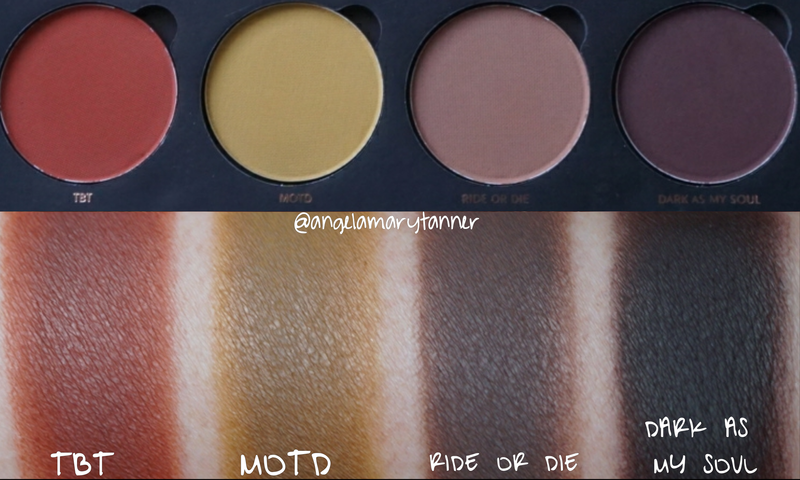 And these mattes are good! I’m impressed af. 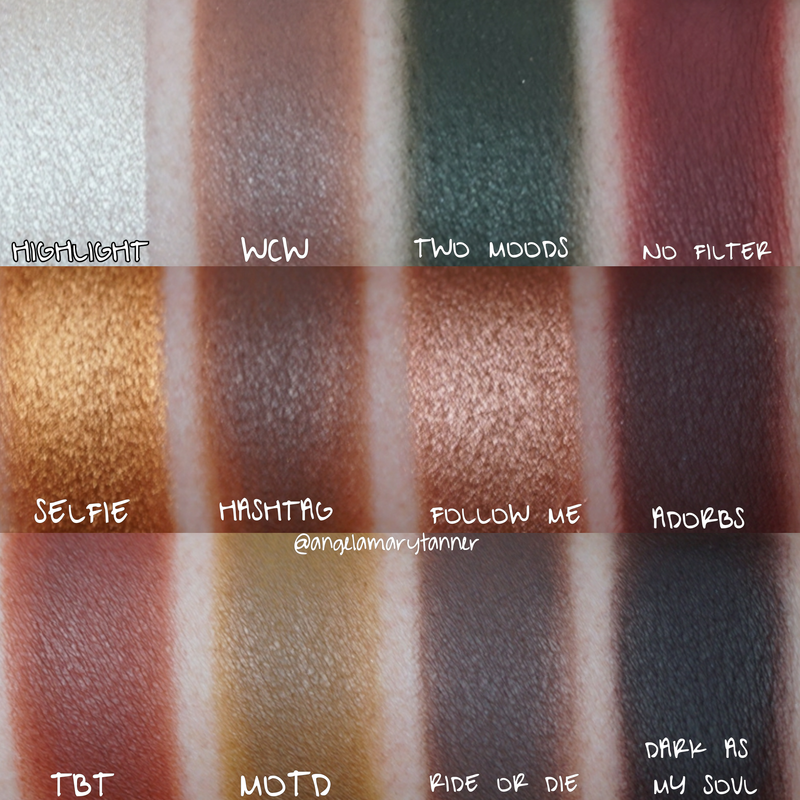 I think you can tell by looking at the swatches how creamy these shadows are. They apply beautifully on the eyes and they’re long lasting and crazy pigmented. There is some shadow kick up in the pans but I didn’t find the fall out to be too bad, if I tapped off my brush first. And the two metallics… Jesus Christ Shepard of Judea!!! Those two are nothing sort of miraculous. They knocked my socks off. I’ve been bare foot since Saturday. I will buy every metallic shadow this woman creates for the rest of my life. Ugh. I’m so extra. But in all honesty, I felt like one little brush stroke could cover my whole arm. 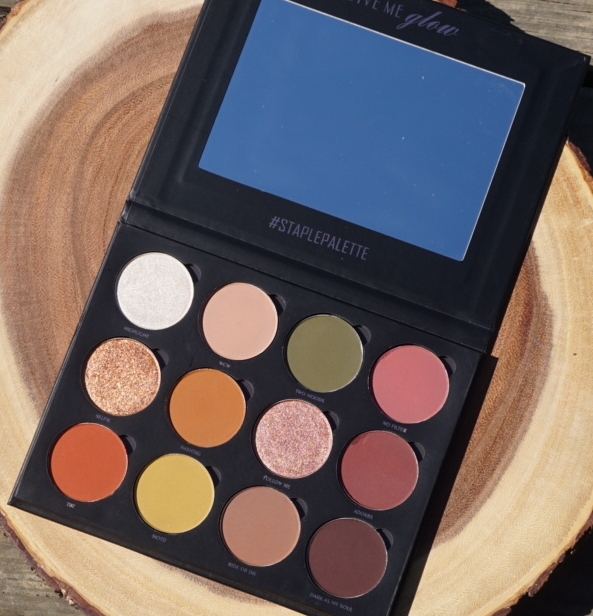 The palette is obviously cruelty free and it’s also vegan, paraben free and talc free. And the constructive criticisms… I posted the back of the box at the beginning of the article but I’m going to do it again now. 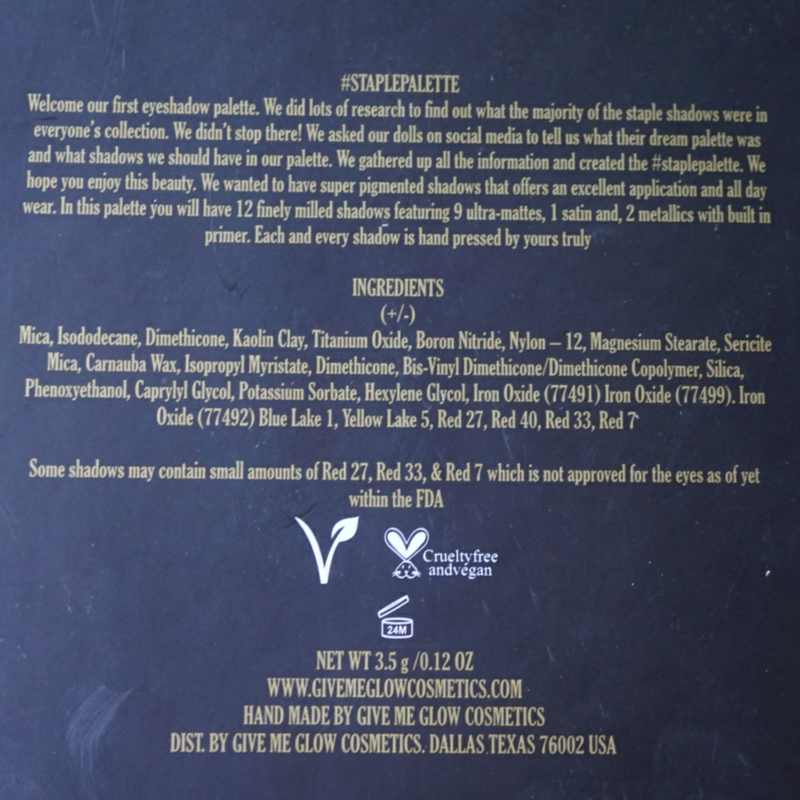 I was concerned when I saw the part that says some shadows may contain dyes not approved by the fda. 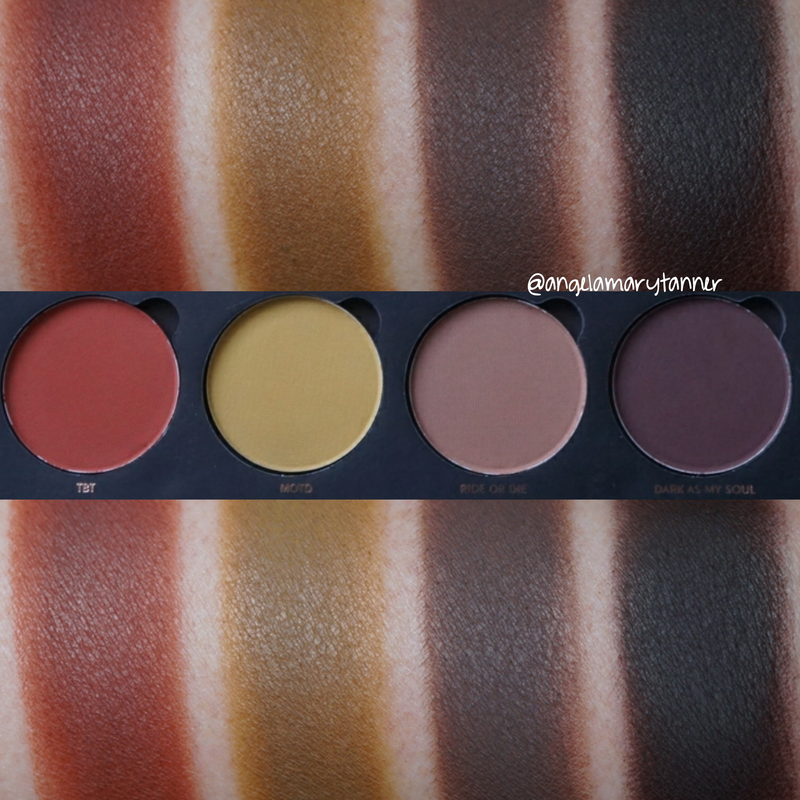 We just talked about this in my CP nectar post as 2 of those shadows contain the same or similar dyes. They’re also found in the Electric Palette, some Melt Cosmetics shadows and probably many others. There’s also some dyes that aren’t lip safe. What I’m trying to say is that it’s not uncommon. I don’t personally have a sensitivity to these dyes and don’t hesitate to use them but I’d encourage you to do your own research and to use caution before using them on yourself. Phew! I’m long winded sometimes. Okay so here’s what concerned me, the ‘some shadows’ part. Because that leaves a lot of unanswered questions. Well two really. How many shadows? And which ones specifically? I’ve spoken to Brandy regarding this and the ONLY shadow containing these dyes is ‘NO FILTER’. She will specify this on her website and answer any questions or concerns that you may have. 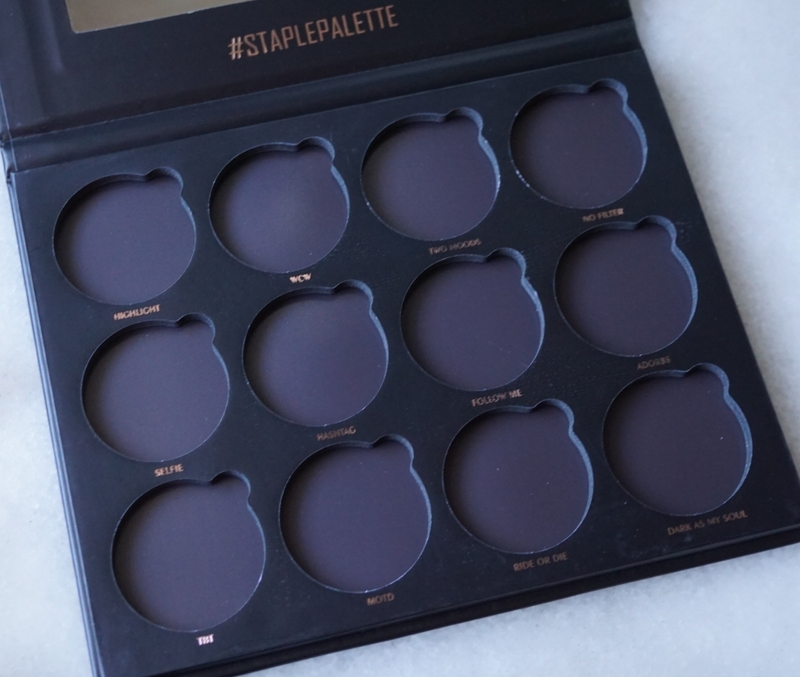 The reason that the shadow wasn’t named specifically is because when the packaging was sent to production she was still formulating her shadows. At the time she wasn’t certain which shades would contain these dyes. Okay, I think I’ve explained that to the best of my ability but I’m a novice here so please feel free to do more research or contact the GMG customer service team. 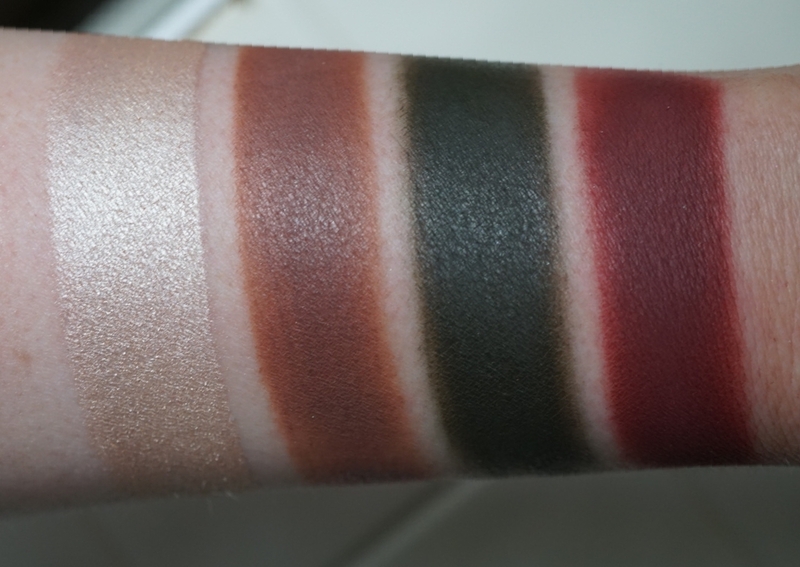 My second… not criticism exactly because it’s not really negative… but several of the shadows swatched darker on me than they looked in the pans. This could be due to several reasons. 1. I’m ridiculously pale right now so everything looks darker on me. 2. The shadows are reeeeaaaally pigmented. I realized that pretty quickly and made sure to use light pressure and to only pick up the bare minimum of product with my brush. 3. It might have something to do with the specific formulation of the shadows and my skin chemistry. That’s way over my head and I’m not going to elaborate on that possibility any further because I’m not smart enough to do so. And again I don’t necessarily consider this to be a negative, it’s just something I wanted to point out. 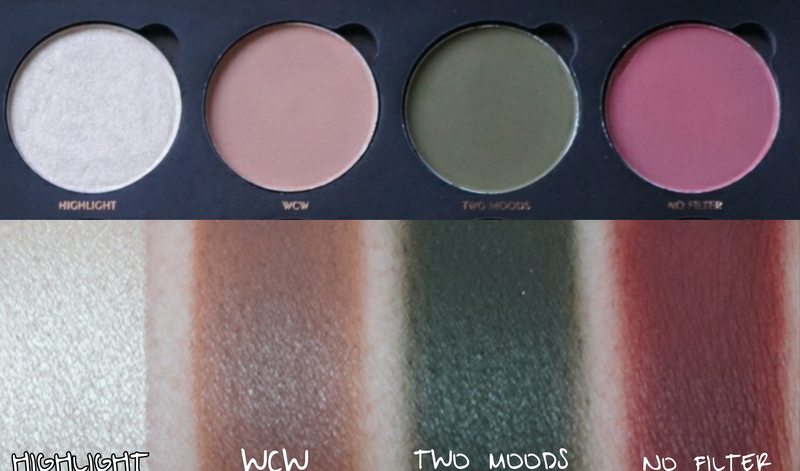 Now since I’m so fair right now the only transition color for me would be WCW. And TBT with a light hand. So I might have to dip into another another palette for a peach smoothie type color. 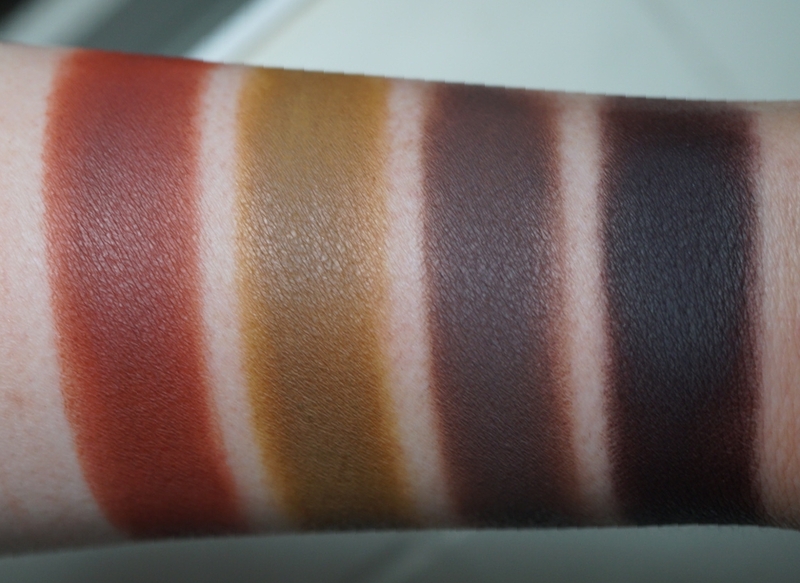 But for medium and darker skin tones there’s lots of other possibilities. These colors are on the basic side but that’s what she was going for, a classic useful palette. And in this she succeeded. Now I’m ready for her to make a fun, colorful palette!! I genuinely love this palette. I’ve been using it non-stop and I’m extremely impressed with her formulations. $54 is on the pricy side but not when you take into account the amount of product that it contains. If these are colors that you could see yourself using on a daily basis then I would absolutely recommend picking this up. 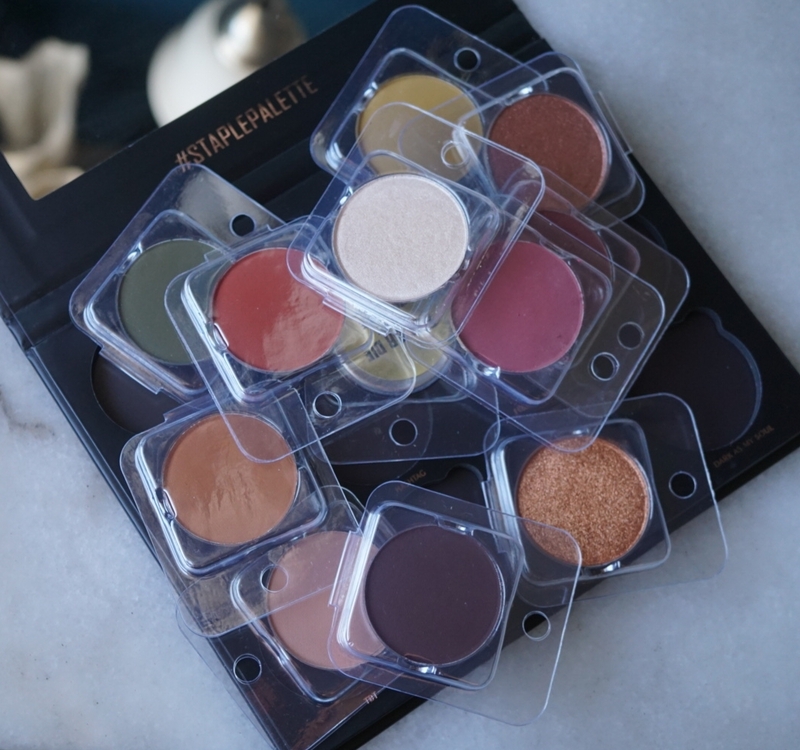 She also has some single shadows on her website and when her monster 88 pan magnetic palette comes out, I’ll be picking up that as well as the single shadows to review for you guys! Next Rachel Zoe Box of Style Subscription Box! Review and savings! 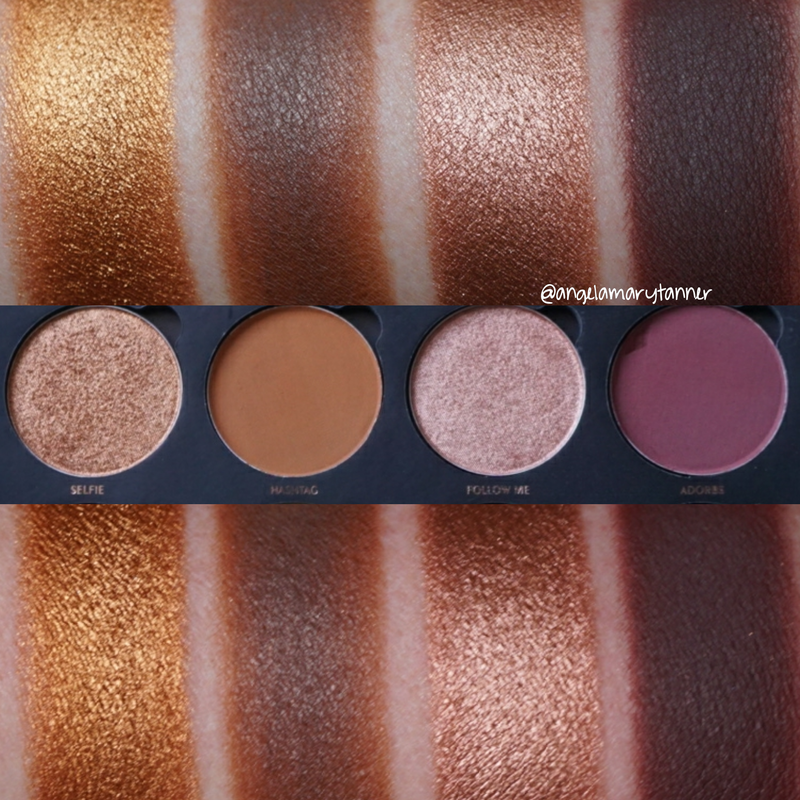 This palette looks beautiful!! Good to know this is permanent! I’ve bought too much eyeshadow lately so I’ll probably hold off from buying it. I can’t wait till their huge empty palette comes out though! !